If you’re looking for a festive family outing this holiday season, ‘42nd Street’ delivers the goods along with lots of glitz. 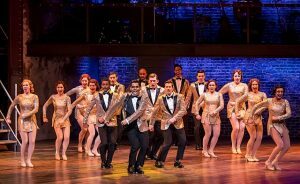 Now playing at Drury Lane Theatre in Oakbrook Terrace, the much-beloved musical is charged with perky tunes and high-energy dancing. Tap dancing, that is. It’s a dreams-come-true story of a sweet, aspiring young chorus girl named Peggy Sawyer. She fumbles her first big audition and ultimately lands the starring role in a new Broadway production called “Pretty Lady.” Woven throughout are show-stopping song-and-dance numbers and subplots of love triangles and financial woes. All are wrapped up neatly by the end of the show. Directed by Michael Heitzman, the Drury Lane production features a stellar cast of actors, singers and dancers. Kimberly Immanuel plays Peggy with both innocence and strength. Suzzanne Douglas as the aging prima donna Dorothy Brock and Donica Lynn as songwriter Maggie Jones are powerhouse solo artists but in different ways. Douglas sings with crystal clarity while Lynn gets sultry and soulful. Gene Weygandt, who plays “Pretty Lady” director Julian Marsh, has a voice that is honest and heroic. Special mention goes to the ensemble of tap dancers, whose work appears effortless and truly joyful, and to choreographer Jared Grimes who managed to incorporate dress racks and stock pots into dance numbers. The showiest, at the end of Act One, takes “We’re In The Money” literally. The set design by Collette Pollard is more spartan than that of other Drury Lane productions, but it works. Most of the action takes place in a weary rehearsal hall, and the scenery is the dancers themselves. Also on the creative team are costume designer Emilio Sosa and lighting designer Mike Baldassari. The ’42nd Street Orchestra’ is conducted by Chris Sargent, who also plays keyboard. The original 1980 Broadway production won the Tony Award for Best Musical. It was produced by David Merrick and directed and choreographed by an ailing Gower Champion, who passed away only hours before opening night. The musical, however, lives on. DETAILS: ’42nd Street’ is at Drury Lane Theatre, 100 Drury Lane, Oakbrook Terrace, through Jan. 7. Running time: 2 hours, 20 minutes with one intermission. For tickets and other information, call (630) 530-0111 or visit Drury Lane Theatre.